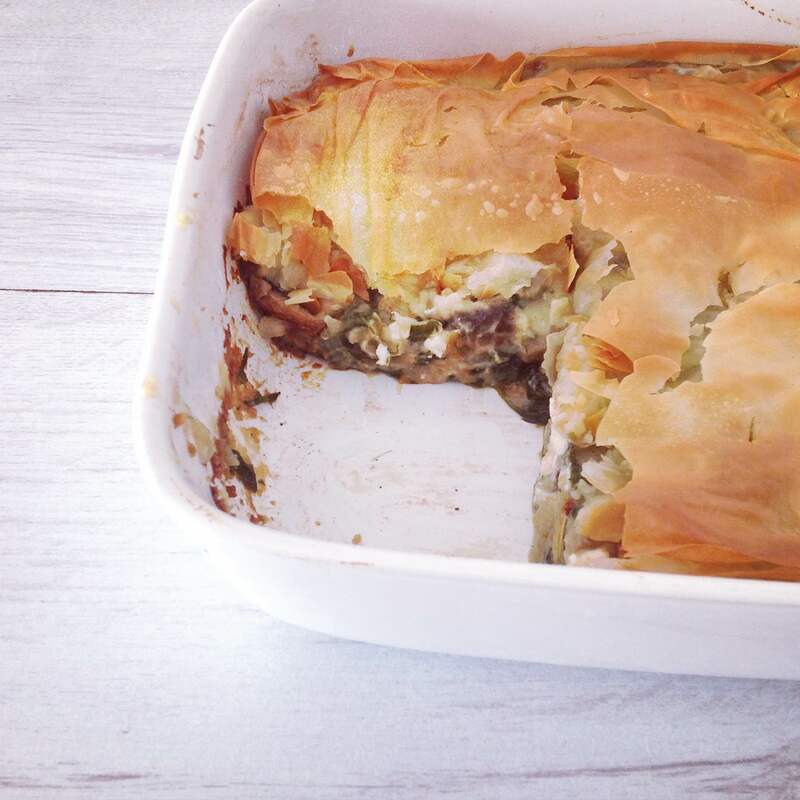 So when I discovered a giant bag of spinach in my fridge, that was in danger of going off – I decided to make my own interpretation of the spanakopita. 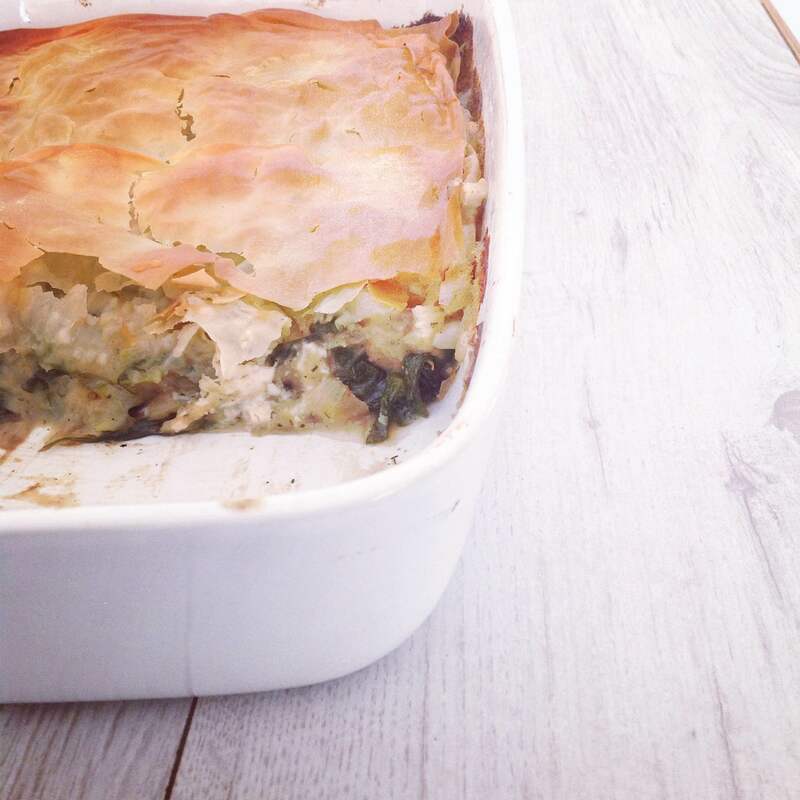 My recipe has all the components of a traditional spanakopita along with chunky aubergine, potato and dill. Nom. 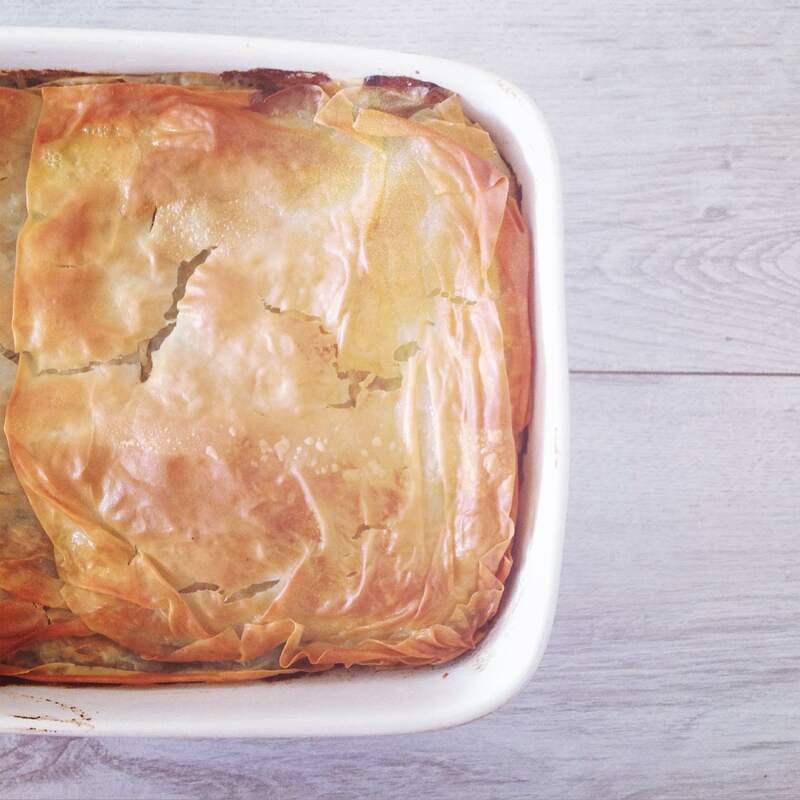 In Greece, this pie is often enjoyed as a snack. My recipe is less of a snack, more of a main meal affair. It can be served hot or cold, as it is or with salad, for lunch or dinner. It makes a great Sunday roast alternative. And I guarantee, both vegetarians and meat-eaters alike will love this! It is super-comforting and cheesy. There is butter in this recipe, but I have chosen to use less pastry and cut back on butter in comparison to traditional spanakopita recipes. It is healthier, without compromising on the taste. Winning! Here is how I did it! 1 large aubergine, sliced length-ways. Pre-heat the oven to gas mark 6. Grease a large pie dish, this recipe serves 6 hungry people! Add the potato, yeast flakes, bouillon powder, garlic powder, dill and onion powder. Fry until the potato starts to soften and brown. The smaller the potato cubes, the faster they will cook. Whilst the potato mixture is cooking, grill your aubergine slices. Set aside until later. Back to the potato filling! Scatter the flour over the potato mixture and allow it to coat all the ingredients. This should bind to everything thanks to the butter. Add the milk, stirring thoroughly. The milk should combine with the butter and the flour and make a creamy sauce. If the mixture looks too floury or stiff, add a dash more milk to loosen it. You are aiming for a thick, creamy filling. Don’t worry if your potato cubes get a bit mashed at this stage, it all contributes to the creamy texture. Blanch the spinach for a few seconds in boiling water, drain and add to the filling mixture. Stir in the cubes of feta and allow to stand for a few minutes. Layer your grilled aubergine slices on the bottom of your favourite pie dish. Smooth the mixture over the top of the aubergine slices. Place a sheet of filo pastry on top, brush with butter and then repeat with the remaining two sheets. Bake on gas mark 6 for about half an hour or until the top of the pastry has become a beautiful golden brown. Serve and devour! Save the rest for lunch the next day, you will thank yourself later! Posted on November 8, 2015 January 6, 2016 by TinaManahaiPosted in Dinner, RecipeTagged aubergine, comfort, dinner, Feta, Filo, Food, Greek, meatfree mondays, Pie, Spinach, Sunday, Vegetarian. Thanks Meg! It really was scrummy, perfect for gloomy Sundays! Looks amazing. I can’t wait to try.